Keeping up with the latest gun laws of your state has become more important than ever in making sure you are on the right side of the law when it comes to owning and using your firearms. As a gun-friendly state, Kansas only has a few gun laws that you’ll need to keep in mind. In this guide, we’ll go over everything you need to know on how to buy a gun and be a responsible gun owner! 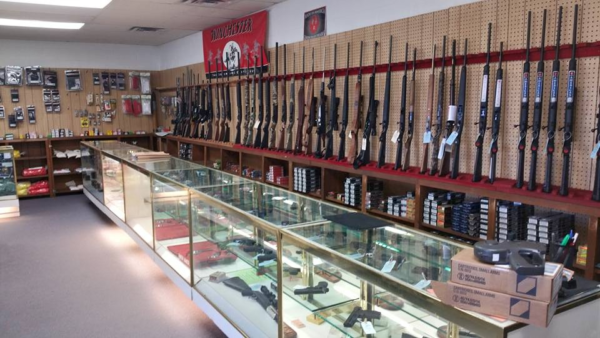 Buying a handgun or a long gun is a pretty painless process in Kansas. You can’t just walk into your local gun store and leave with a new Glock in 5 minutes, but if you follow all the steps, it’ll seem like no time at all. No permit is required to buy a firearm, but there are a few requirements. Have a background check done by a licensed firearms dealer. Pretty easy, right? But that’s what the state says the requirements are. The federal government says you must be 21 or older to buy a handgun. So how does that work? Basically, if you are 21 or older, you can go and buy a handgun from your local gun store. If you are between 18 and 21, you can only buy a handgun through a private sale. The upside is, when you buy a gun through a private sale, you don’t need to have that background check done! 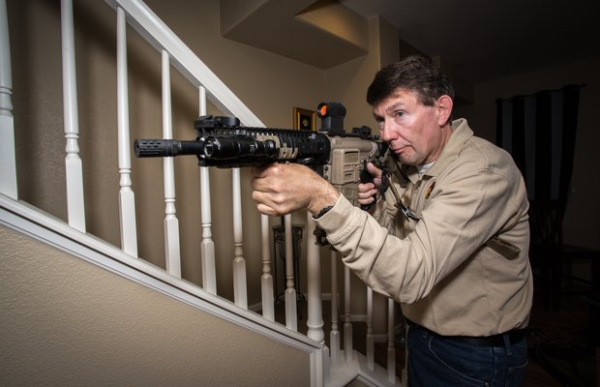 The laws on long guns are also a little tricky when it comes to the state versus federal laws. 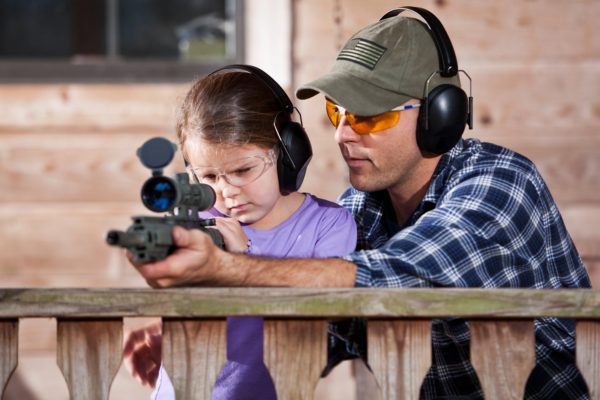 Kansas does not have an age requirement when it comes to buying or owning a long gun. But the federal government does! Have a background check done. Like with handguns, the federal government has an age requirement that does not fit with the state requirement. If you want to buy from your local gun dealer, you’ll need to follow the rules above. If you are under 18, or just want to get that rifle for your 15th birthday, you can always buy it from someone through a private sale, or a family member or friend can transfer one to you. No permit is required to buy a long gun. There are some restrictions that will prevent you from owning a gun, even if you meet all the other requirements. Were convicted of a felony in the last 5 years for a crime that did not involve firearms. Essentially, if you have any sort of criminal record or history of drug or alcohol abuse, you may be out of luck. If none of those things apply to you, then great! At home, carrying the firearm for self-defense purposes, with permission from your parent, legal guardian, or grandparent. Don’t need to be 18 to go shooting! Where can you take your gun? Once you’ve got that new gun in your hands, you’ll want to be careful about where you take it. 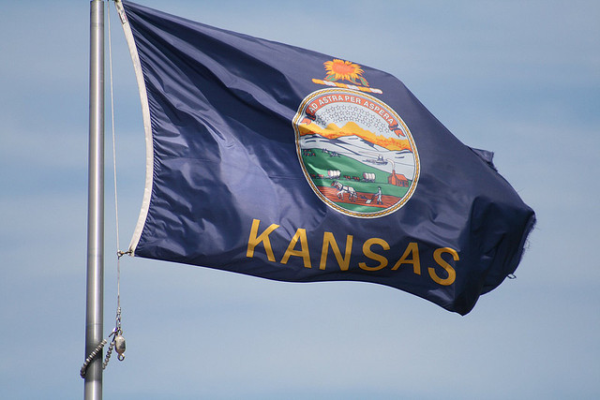 A permit is not required for open or concealed carry of firearms in Kansas. You do need to be 21 or older to concealed carry your handgun though. That means you can walk around with your AR-15 slung around your back and your Glock at your hip. But just because you can doesn’t mean you should. You need to use your best judgement to decide whether it is a good idea to be openly carrying your firearms around town, even if it is perfectly legal. Unless there are lots of others also carrying wherever you happen to be, it may give you unwanted attention being the only person openly carrying a firearm. Why does the state issue CCW permits then? Even though the state only requires that you be 21 or older to carry a concealed handgun, no permit required, it does issue CCW permits. Having a permit allows the permit holder to enjoy reciprocity of their concealed carry rights in other states that also recognize a Kansas CCW permit. So if you ever plan on travelling to another state and want to keep that handgun tucked in your waistband, a Kansas CCW permit is the way to go. For anyone interested, check out our Kansas CCW section to find out all the steps to getting that permit, and all the places where you can use it! Literally! There are no laws on how you can transport your firearms. Since open and concealed carry are legal in the state without any additional permits, you can keep a loaded gun in the car with you however you want. 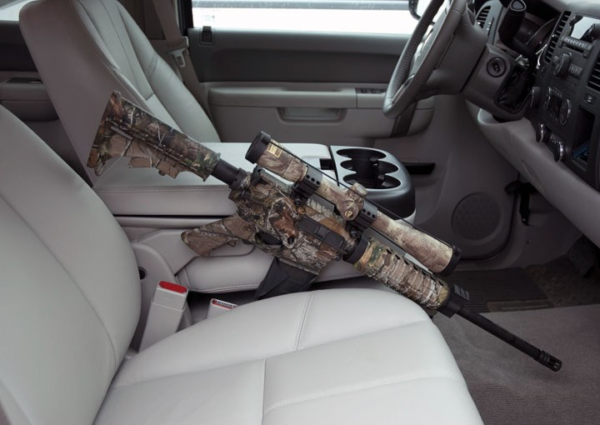 It might not be a good idea to stick it between your legs while you’re driving, but putting the handgun or rifle next to you in the passenger’s seat would probably be okay. Good thing it’s camo so no one can see it! Guns are welcome in most places in Kansas, including college campuses, but you will still need to keep in mind the places where you may want to leave your gun in the car. Places like police stations, jails, detention centers, and courthouses are all off limits, as well as medical centers. Basically, anywhere that has metal detectors is probably a place where you should not try to bring your guns. Stick them in a car safe and hide them somewhere out of sight in the trunk so they’ll be waiting when you get back. Since you can open and concealed carry your firearms without a permit, it makes sense Kansas would also have gun-friendly self-defense laws. The state has adopted what is commonly known as the “Castle Doctrine”, which lets you defend your home, or “castle”. You can use any appropriate force, including deadly force, if you reasonably believe it is necessary to prevent or stop someone from illegally entering your home or prevent death or great bodily harm to you or someone else. This applies to any property you are legally in possession of, including your home, workplace, or vehicle. Similar to the Castle Doctrine, Kansas also follows the “Stand Your Ground” policy, which says that you can use deadly force against someone if you reasonably believe it is necessary to defend yourself or another person from death or great bodily harm, without a duty to retreat. If you are out at the movies and run into a situation where deadly force on your part may be required to stop a threat, you do not have to retreat, but can engage and end the threat if you reasonably think it is necessary to do so. But keep in mind, just because you do not have a duty to retreat does not mean you must use deadly force in every situation, even if you are justified in doing so. Sometimes, it may be safer for you and others involved to safely retreat rather than to engage the threat. Though it’s not a law, it is always a good idea to lock away your shiny pistols and rifles when they’re not on your hip or slung over your shoulder.